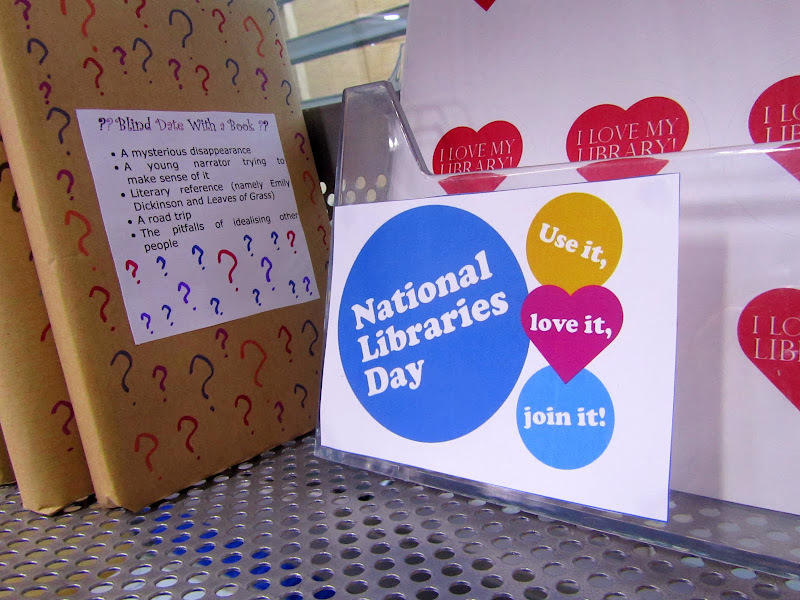 Happy National Libraries Day! As part of my library’s celebrations I’ve been hard at work these past few weeks putting together a “Blind Date with a Book” display. 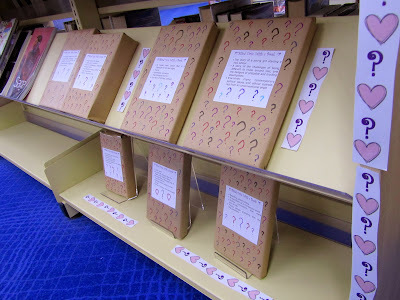 As some of you might know, this is an idea that has spread like wild fire over the past few years as several libraries around the world joined in — there’s even a dedicated Pinterest Board full of pictures of the results. 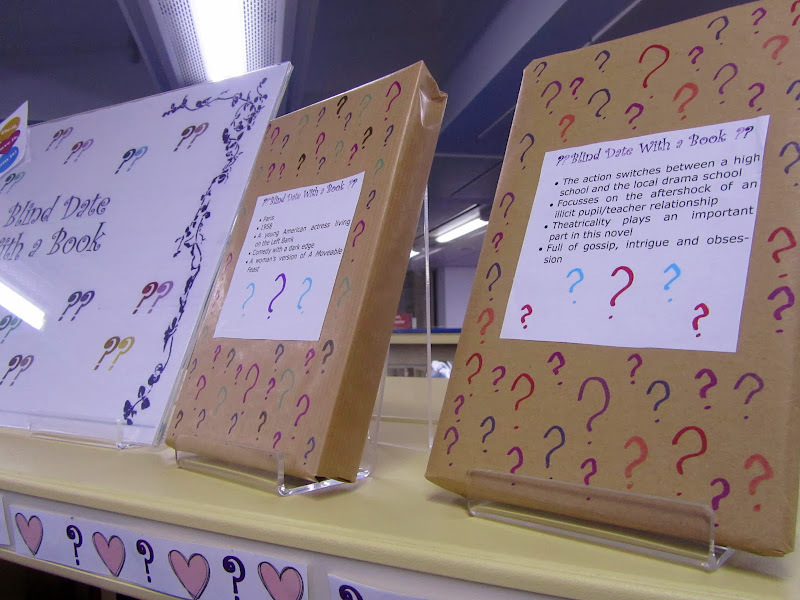 The basic idea is to encourage patrons to step out of their comfort zones and pick up a book they normally wouldn’t. 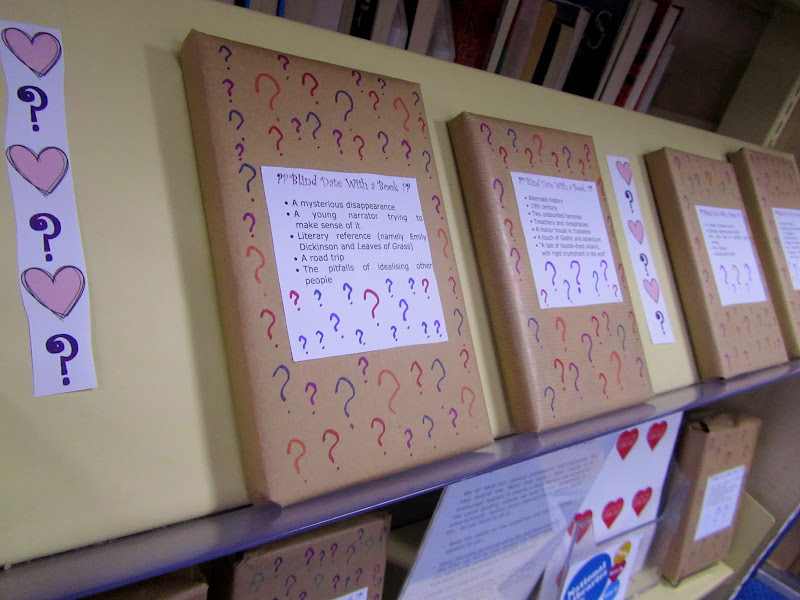 We do this by wrapping books in brown paper and labelling them with nothing but a few hints of what they’ll find inside. It’s at its core an exercise in reader’s development, and few things make me happier than that. 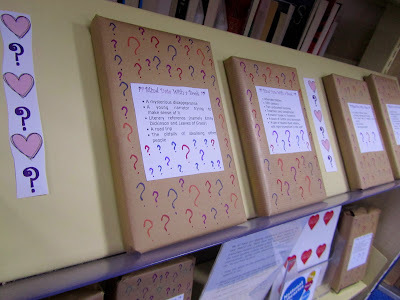 Between picking the books, wrapping them, decorating them and coming up with the descriptions, I soon learned that this kind of display is very labour intensive, but with the invaluable help of a few colleagues, I managed to prepare 45 books. I really hope people will enjoy the challenge. The one thing I was careful to do was not give away the books’ genre or marketing category, and my instructions encourage people to give their books at least a few chapters even if they come from a section of the library they normally stay away from. If by the time we’re done someone with preconceived ideas about, say, SFF or YA discovers there’s more to these books than they suspected, I’ll consider it a job well done. 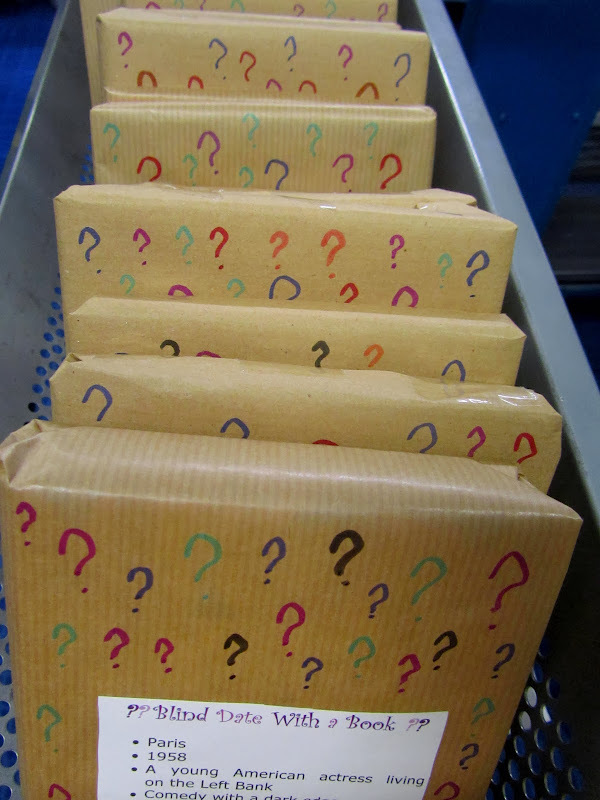 You wrapped 45 book? In awe. And the display looks lovely. This is a cool idea, and you did such a lovely job! It looks great. Looove it! We've done a similar sort of display here for Freedom to Read Week -- I put a sticker on the paper that says "Someone didn't want you to see this book. Are you going to let them tell you what to do?" It usually goes over quite well. That's coming up at the end of the month for us, again! What a wonderful idea! I cannot imagine that it won't be a big hit. I wish my library did something like that all--all the time! Sometimes it's too easy to follow a list full of things we know are to our tastes. I'm so impressed that you did 45 of them! That's so so many! Well done -- it looks like an amazing and fun display. This is truly incredible. Wow. This looks great! We do this as well, and yes, it is quite labour intensive -- there are 3 of us working on it this year. 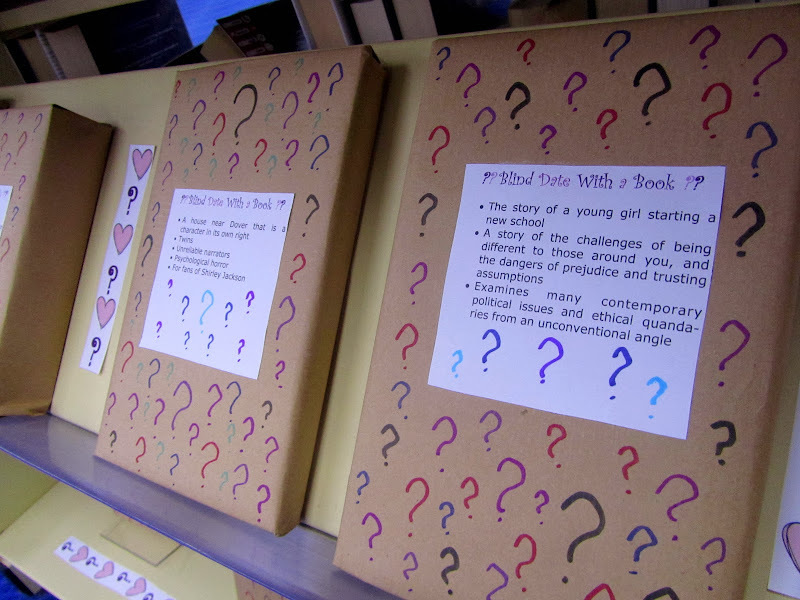 We encourage people to give their choice a go no matter what it is (mostly by including a rating sheet inside that they can fill out after reading and enter for a prize -- chocolate of course) Last year we had quite a few comments that their book was something they never would have chosen but that they really enjoyed it -- just the result we all hope for, I think! This is so much fun! Seeing those wrapped books makes me want to open pretty much all of them - especially since you picked them out. 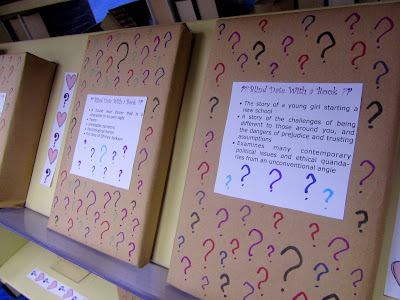 Oh my gosh, what a fantastically cool idea! I cannot imagine how much time went into it, but at least I'll bet it was fun. 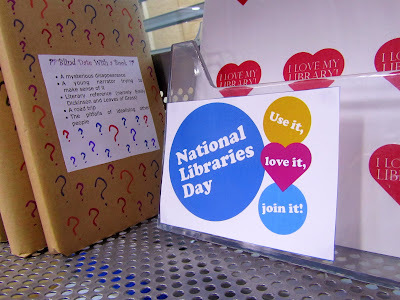 :) Wish our library would do something like that! This is just amazing. Such a fantastic idea. I also like what Kiirstin noted. Great places, libraries! 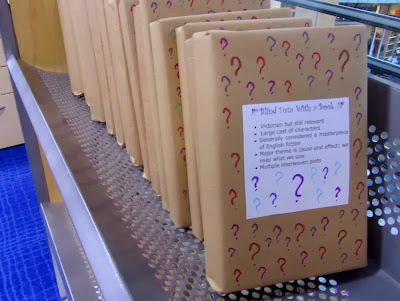 I wish my local library would do this! Please let us know people's feedback. 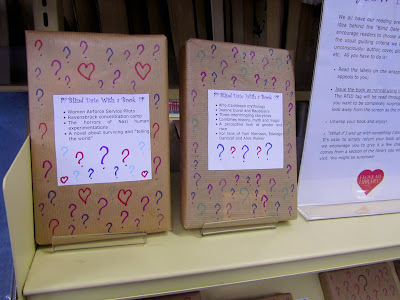 I've loved the blind date with a book idea ever since I first heard about it. So fun that you get to actually do it! 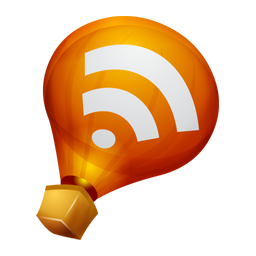 Has it gotten a good response from your patrons? The display looks fantastic! So much fun! And a way to get people reading out of their comfort zone. Win win? Lovely job, Ana! 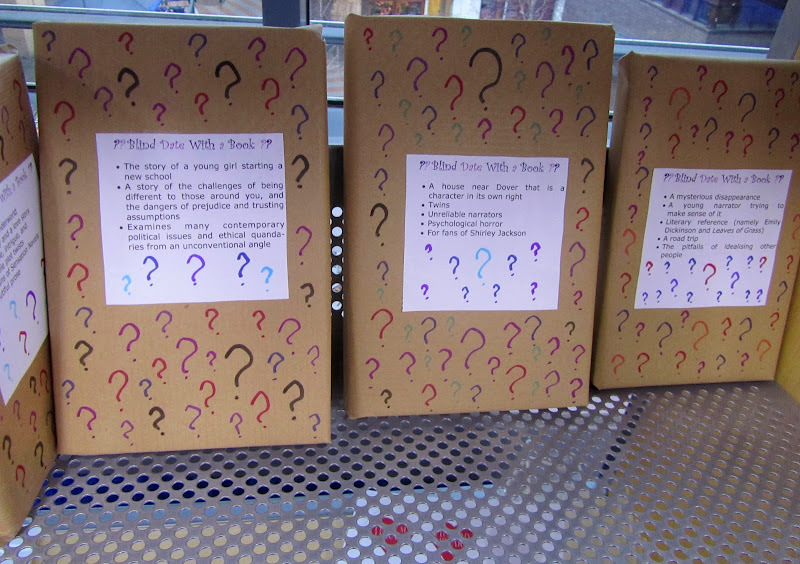 What a fantastic idea of getting people to read different books! Too Fond: It's tempting, isn't it? We had someone cheat by partially unwrapping one and leaving it! Laura: Yes, that's really the main thing I wanted to achieve with this. Of course that stops people from returning the books once they realise they're [genre they don't read], but perhaps once they take them home they'll more easily give them a try. Kiirstin: Oooh, I love that idea! I can now say that it was a big success here as well - lots of great feedback and they disappeared in a few days! 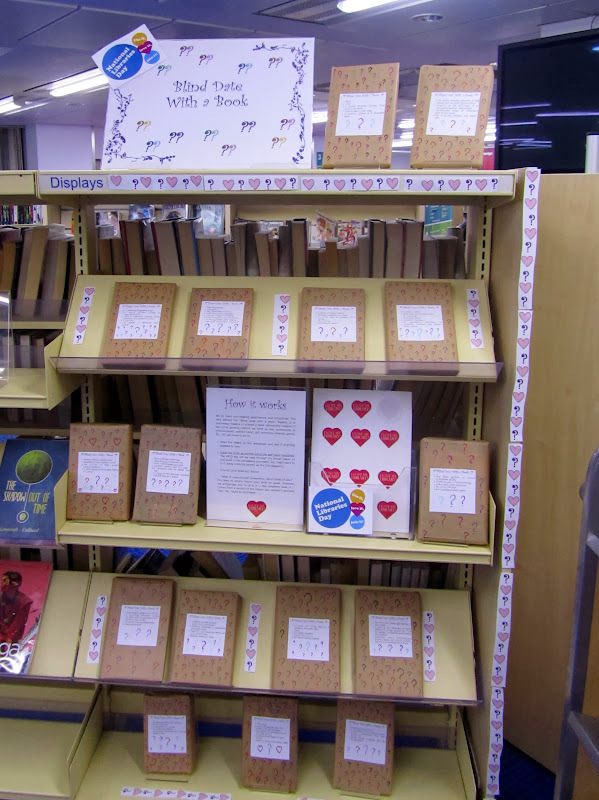 I had to wrap 15 more so we could keep the display up until Valentine's Day. Priscilla: I'm happy to report that our patrons really liked it! Maybe suggest it to your library? Every year the idea seems to spread a bit further. Noémi: Please do! It's lovely to see the idea spread. Trisha: Aww! I had lots of help from colleagues, but a lot of books I'm enthusiastic about did make the final selection. Mee: I did, and yep, that took an ungodly amount of time :P I need to see if I can find question mark stickers for next time. I don't know where the very first display of this kind was either, but hopefully whoever thought it up is please that it has spread so far! Melissa: I wish I could credit whoever thought of it first! The fact that it's spread so far just goes to show how awesome it is. Gricel: Yes, I definitely think it would work at any time of the year! And we've have that problem here too - people will come to the desk and ask if they're allowed to borrow from the displays. I wonder why that is?